The Bank of England has confirmed the old £10 note will be removed from circulation on 1st March 2018. This will be replaced with the new polymer note which was issued in September 2017. The old paper £10 note features Charles Darwin and is 142mm x 75mm. 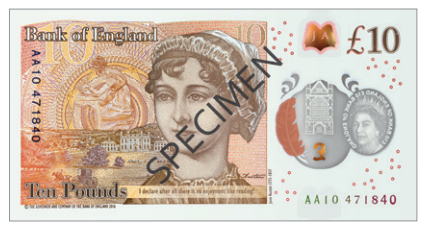 The new £10 note is printed on polymer (a thin and flexible plastic material), it features an image of Jane Austen and is 132mm x 69mm. More information on the new £10 note can be found at www.thenewten.co.uk. Retailers are advised to contact the suppliers of their cash handling machines to discuss what adaptations will need to be made for the removal of the £10 note. 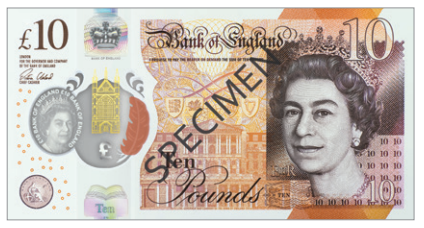 For more information on the removal of the £10 note, please click here.